A hat-trick of goals from Milly Sheridan helped Mayo claim the All-Ireland U14 B ladies football title after a goal fest in Ballinasloe. Coming in as underdogs, Mayo hit four first-half goals to take total control before another three after the break held off any Tipperary hopes of a fightback. Sheridan was player of the match, but others including Sinead Walsh, Clara Barrett, Niamh O'Malley and full back Amy Dunleavy were equally instrumental. Walsh opened with a Mayo free but Tipperary enjoyed the better of the early exchanges. Niamh Costigan scored on three minutes before Sara Finnane quickly made it 0-2 to 0-1 to the Munster champions. Laura Moran and Walsh gave Mayo the initiative but a crucial score came on eight minutes. Kate McGrath did well to hold the ball and send play to her left. Costigan ran at the opposing defence before striking past Amy Mahon. Another Saoirse Keating score had Tipperary 1-3 to 0-3 clear. Tipp needed that good start, but their challenge slipped soon after. Walsh miscued a free kick that dropped in the square and Barrett was perfectly placed punching the equalising goal. The teams traded minors before Clara English made it 1-5 to 1-4 in Tipperary's favour before Sheridan made her introduction on 25 minutes. Lilian Keane and O'Malley did the work out to the left corner where Sheridan got control and took on the opposition before getting within range and hitting the net. Sheridan profited from Keane's industry to toe-poke a third goal, and when another Keane ball in added time wasn’t cleared, Keane hit the net to make it 4-5 to 1-7 at half-time. Tipperary had a strong wind for the second half but Mayo stretched the margin through Walsh, Ava McGahan and Keane making it 4-8 to 1-9 on 38 minutes. However, Tipperary did get back within three points. Finnane and Kate Moore got their opening second-half scores and Kate Flanney contributed a brace. But with Costigan exploiting space on 40 minutes, she found Finnane for the goal reducing arrears to 4-8 to 2-11. But Mayo got a break on the three-quarter mark when Alannah Devereux won a penalty resulting in a Kate Burke yellow card. Walsh kept her composure and scored off the underside of the crossbar. Tipperary continued battling but Mayo added two goals through Sheridan and Devereux. 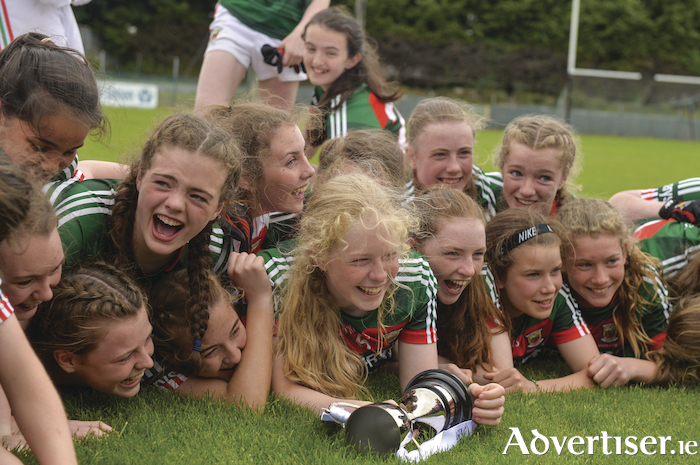 Kate Delaney got a consolation Tipperary major five minutes from time but despite an impressive tally, it was Mayo that claimed a first All-Ireland under 14 B title in 10 years.